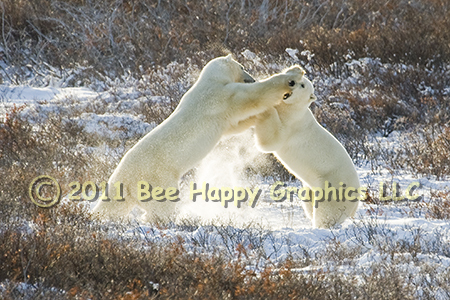 Were these two bears to meet on the ice, it probably wouldn’t be friendly. When they are forced to congregate around Churchill, however, the normally solitary animals can be rather sociable. These two bears are just play fighting. Their bouts don’t last long, as both bears overheat easily in the sweltering heat; the temperature when we were there was in the mid twenties. The normal November temperature is in the teens, and out on the ice during the winter it can get below minus thirty degrees Fahrenheit. For more images and information about this encounter, see Polar Bear Encounter. Photographic details: Canon EOS 30D camera w/ EF 100-400mm f/4.5-5.6L IS USM lens set at 400mm. Flash was not used. Camera was on f/7.1 for 1/800 sec (shutter priority with +2/3-stop exposure compensation) at ISO 400. Fine Art Paper 31/2" x 5" 71/2" x 111/2"
Canvas N/A 10" x 15"